Orbin has invited people to a mansion which used to be owned by Sir Arthur Quenton in July, 1966. Orbin shows them portraits of a boy. They are imitations of Rampton. Sir Arthur Quenton painted 11 portraits of the boy. The last piece was painted in May 20, 1889. He died three months after he painted it, at the age of 33. He had an accident when he was a child and lost his left ear and had some scars in the face. He was an unsociable man. He lived in this mansion alone. No record is left about the boy. "Mr. Orbin, Have you invited us to tell us about the portraits? I don't care who he was." says Roger. Saying "There's another stoty about the boy," Orbin introduces Don Marshall. Don starts his story. 16 years ago, he was in college and traveling in summer. On his way to Lester, it started raining suddenly and he sought shelter in Quenton's mansion. He met a real estate agent inside the mansion. The real estate agent said the mansion was for sale. There was a portrait on the wall. He had thought it was Rampton, but the real estate agent said it was an imitation with a different model. He was given it as a souvenir of the trip. The real estate agent sent him to Lester in his car. He got on the train bound for Birming Ham. On the train, he saw two boys with a bunch of roses. He hadn't seen the portrait very well, so he didn't pay any attention to them. He later knew it was August 21, Sir Arthur Quenton died on the same day in 1889. When they were getting off the train, the portrait fell off the shelf onto a boy's head. Another boy looked very worried about him. Edgar said "I'm ok." And they got off the train. He followed them feeling responsible. On the platform, He found out that Edgar was standing and Allan got sick to see the blood. Even though he wanted to take Edgar to the doctor's, they walked away. When he came up with Edgar, Edgar said his house was there and he had no parents. The blood was dried and he thought Edgar's injury wasn't serious. Going back to the station, he found out the next train wouldn't come until the next day. He got back to Edgar's house to ask him to let him stay there overnight. He saw red roses burning in the stove. The boys were getting into the house from outside. Edgar served him tea. Edgar said they only used the house in summer. He talked with Edgar and woke up in the morning. He heard someone say "Why don't you do him in?" He had to hurry to the station to catch the eight o'clock train. Roses were all burnt down. On the train, he untied the cover of the portrait to check if Edgar's blood ruined the portrait. He thought the boy in the portrait looked similar to Edgar. Looking at the portrait carefully, he got sure the boy had the same face with Edgar's. He got back to see Edgar. When he was knocking on the door, a man came and said the building was a national property, which had been an early Victorian lodge for fox hunting. The man took care of the building. He got angry to know two boys had stayed there the previous night. He wasn't able to think they were mere naughty boys. In 1953, he wrote a short story titled "Rampton" in a college magazine. It was about the national park and the portrait. In 1964, when he was working for a publishing company, he received a book with a letter. The letter said, "I have read your "Rampton". I've recently read the similar story in a German book, I'm enclosing it." The title of the book was "Glen Smith's Diary" and the author was Margrid Hessen. He was surprised to read the story. The 14-year-old boy with blue eyes and curly hair in it was the very image of Edgar. He went to Frankfurt from London immediately. She said the boys in "Rampton" and "Glen Smith's Diary" must have been the same person. When they were talking in Margrid's place, Louis came. He was Margrid's nephew. He saw the portrait and said, "He looks just like Edgar Portsnel." Louis guided him to Gabrial. The names of Edgar Portsnel and Allan Twilight were recorded in the school document. Louis talked about them as much as he remembered. He wondered how many times the name Edgar Portsnel was recorded in documents for the two centuries and how many documents were left. He married Margrid in England. In 1965, he published a book titled "Vampanella Hunting". 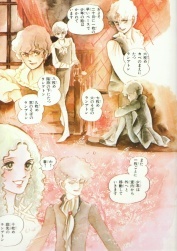 Charlotte says it's very romantic the boy made Don and Margrid get acquainted. Orbin says he discovered "Vampanella Hunting" in a bookshop and visited Don Marshall immediately and that he purchased Quenton's mansion and found the rest of the Rampton series. Roger: Are you thinking about next books to publish? Roger: Do you hunt a fictitious boy? Orbin: He is real. I've seen him. Lidelle saw them, too. She has passed away, but she was living with Edgar and Allan for eight years. They exist beyond time. I've been chasing them for 30 years. Roger: We're no Vampanella mania. We're here because we were invited, so we're not interested in your story. Orbin: You're one of the key people, because you're descendants of Oswald O Evans. 21 years ago, Evans Library in London got fire and was half burnt. He visited there before it was knocked down and discovered Oswald's will and Dr. Dodo's notes. Edgar and Marybell showed themselves before Henry Evans. According to Dr. Dodo's notes, Henry Evans picked up a boy called Edger from the river. Marybell appeared afterwards and they disappeared together. In the meanwhile, a boy called Earnest was sucked blood. Dr. Dodo says Edgar and Marybell were Vampanellas. He investigated the Evans family line. Oswald had a half sister and a half brother, who died when they were infants. Their names were Edgar and Marybell. Orbin introduces Louis to the attendees. Because Don was very interested in Edgar, he visited some of his classmates during his cycling tour around West Germany. He visited Kilian first of all. He wasn't there and his foster father said he wasn't sure when Kilian would be back. He gave Louis a history book of Germany , which Kilian was always reading. Then he visited Teo in Bonn. He was collecting blood samples. Teo asked Louis to give Kilian's book to him because he didn't have anything Kilian's except his blood sample. Teo said, "It was quite a nightmare, but the two students were real." "Do you mean Edgar and Allan?" asked Louis. He asked Teo to talk about anything about them that he remembered. Teo hesitated because he didn't think anyone would believe his story. Louis said he wouldn't give him Kilian's book unless he talked about it. Orbin introduces Teo to them. Teo says he doesn't believe the existence of vampire or Dracula. He begins to talk. The dead body of a student was found and the festival was discontinued. Before the Mass for the student, Kilian called him and said Matias was dead in the cellar. Kilian said he was killed by Vampanellas, Edgar and Allan. They carried Matias near the marsh. Matias woke up unexpectedly and attacked Kilian. He drove in a branch into Matias. Matias disappeared. That's all. Kilian was bit in his neck. Edgar and Allan left school on the same day. Orbin asks Teo if Kilian cared about being bit. Orbin asks him what he thinks they are. Teo says they are different creatures than humans. Orbin says he wants to see the miracle again even if it's an illusion. Louis says he feels somewhat suffocated. Orbin opens the door and finds a fire. The attendees are going out. When Roger tries to get back, losing sight of Charlotte, a box drops on his head and he passes out. Charlotte tries to save a portrait and loses way to escape. "This way, come!" says Allan. He tries to hold her when she is to drop down from the broken floor, but he sees the cross around her neck and hesitates. Roger regains consciousness and says if only Orbin hadn't held that kind of meeting or Roger hadn't accepted the invitation. Orbin is sure Edgar and Allan set the fire. He has never experienced a worse disturbance. Allan comes back to Edgar with a portrait. He says "I tried to rescue her."